“On the spot!” I yell. Mike rolls the ball out of the D to my feet. I dink it wide to Si who starts a mazy run down the right hand side of the pitch. Si is tricky, I’m glad he is on our side, he is also fast, outpacing Joel he gets to the corner. I find that I have drifted up the 5-a-side court and I am near the opposition goal. This is not a common occurrence, any higher up the pitch and I suspect I would become dizzy. I am not used to playing striker. Defence is where I am more comfortable. I say comfortable, what I mean is I panic less in that third of the court. As a football player I am neither skilful or particularly fit, in fact I suspect that I am here to make 5-&-4-a-side into 5-a-side. Nevertheless I am going to have a go. I have been playing for a few weeks so I am starting to get the gist of the game and its lingo. I have arrived in the centre of the pitch just outside the goalkeeper’s D shaped area (into which I am not allowed to enter) and I am stood on the orange painted disc that is the penalty spot. Si is ahead of me and needs an ‘option’ so I yell “On the spot!” I have heard the others do this when they reach this area. Whether this means I am waiting on the penalty spot or I want the ball played into the general area of the aforementioned orange disc I am not certain but Si seems to get the message. Without looking up he thumps the ball against the back wall of the court, knowing the perfect angle of incidence along which to play the ball on to the wall so it arrives in the correct position for me to place a first time shot into the far left corner of Phil’s goal. In goal Phil is oblivious to my dreadful football ability; he seems to be expecting a left foot BOOM that will shred the net he is guarding. In anticipation he dives full length to his right, skinning a knee in the process. My shinner of a shot dribbles past him to his left and almost apologetically nestles in the back of the net. I’ve scored! I turn on the spot and run back to my own goal, like I meant to do that all along. Si says nothing. I decide that hanging around “on the spot” is not for me. Not for me in a footballing sense, but in a bird photography sense I have had quite a bit of joy hanging around “on the spot”. Today’s spot is on the old shabby bridge that spans one of the ponds at Thurstaston and flitting around in the coppiced willows in front of me is a Chiffchaff. Now, this is where I feel comfortable, this is much more my pace. Just me and something avian to photograph. It isn’t the most glamorous of surroundings, a creaky ancient bridge and the whippy, leafless re-growth from an old coppice, but it will do for me and this Chiffchaff. I had spotted this Chiffy mooching about the willows the previous evening and with a forecast of clouds and a bit of rain through the night with bright sun to follow first thing in the morning I thought I’d take a chance on it hanging around overnight and pop back early doors with the camera. As usual I have arrived early meaning there isn’t anyone else about so I pick my spot on the bridge and wait. 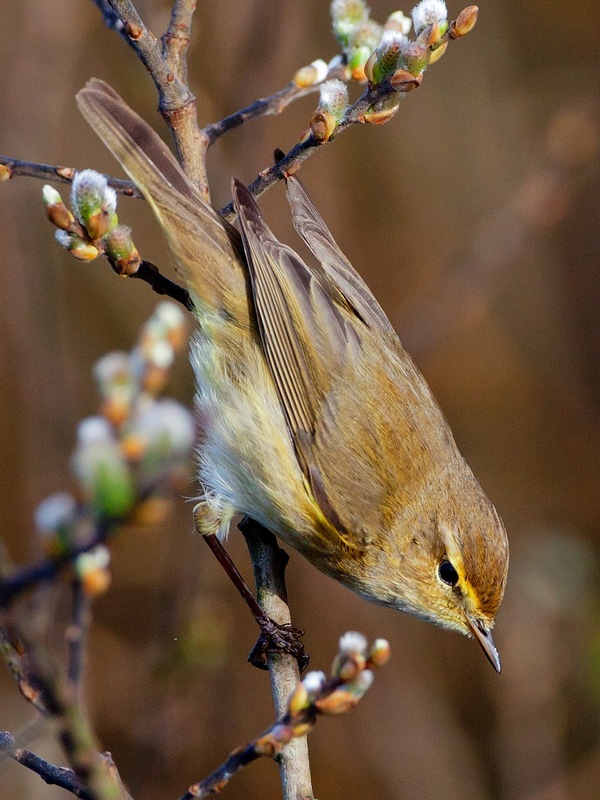 The bridge takes quite a bit of traffic so I figure that the Chiffchaff will be unperturbed by my presence. Plus I am dressed in my finest drab and blend in with the willows and weathered timber, standing still on the spot I shouldn’t be a problem for this bird. 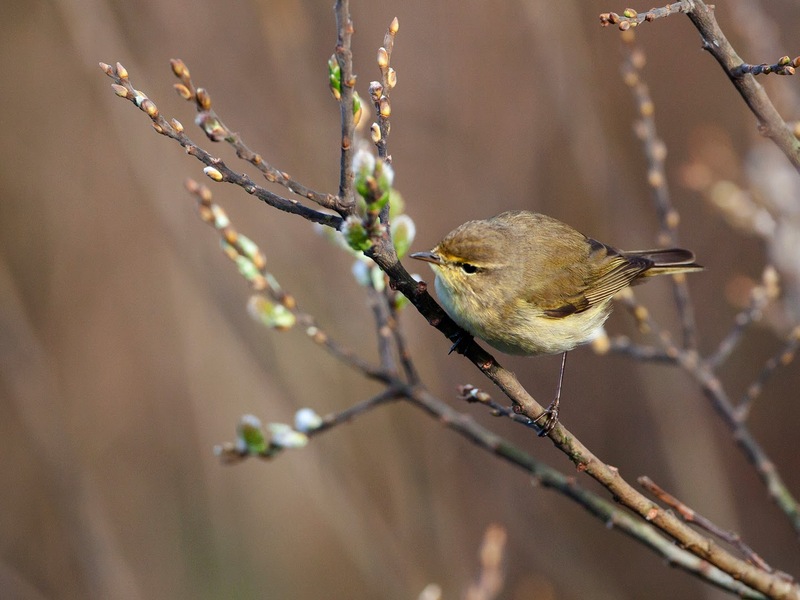 My little Chiffy is a Phylloscopus warbler, Phylloscopus collybita to be precise. The scientific names of birds are something I find really interesting and the Chiffy is one of my favourites. Phyllo is a prefix to a word relating to a leaf and scopus means “one who watches”. So my Chiffy is “one who watches leaves”. Collybita finds its origins in money lending (!) and is used here to describe the song of this species, apparently sounding like two coins being rubbed together. One Who Watches Leaves is certainly living up to its name. 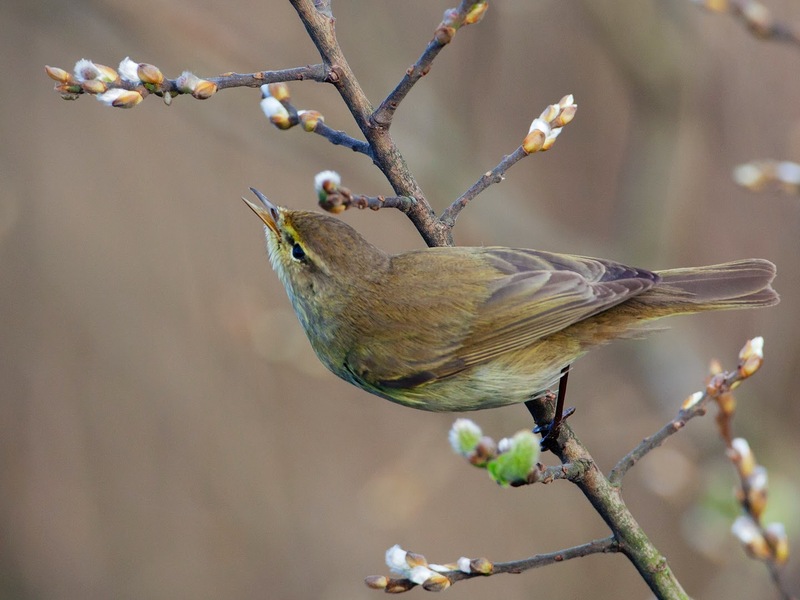 It flits and darts around the coppiced willow with equal amounts of speed and agility, all the while peering at the breaking buds and investigating folds in the bark. It makes frequent darts at something it spots. Its eyesight must be super smart. I have no idea what it is consuming but seems to be finding plenty for breakfast. Perhaps it is finding roosting bugs, already there have been plenty on the wing in this mild spring but the day has started chilly and they are not active yet. One Who… might also be looking for insect larvae not yet hatched. Whatever its doing, it is great to watch and even better to photograph. Collybita stays silent the whole time we are together; it is intent on refuelling after a mammoth migration rather than establishing a territory. Soon though it will move from this pond pit stop and take up residence on the Wirral Way. 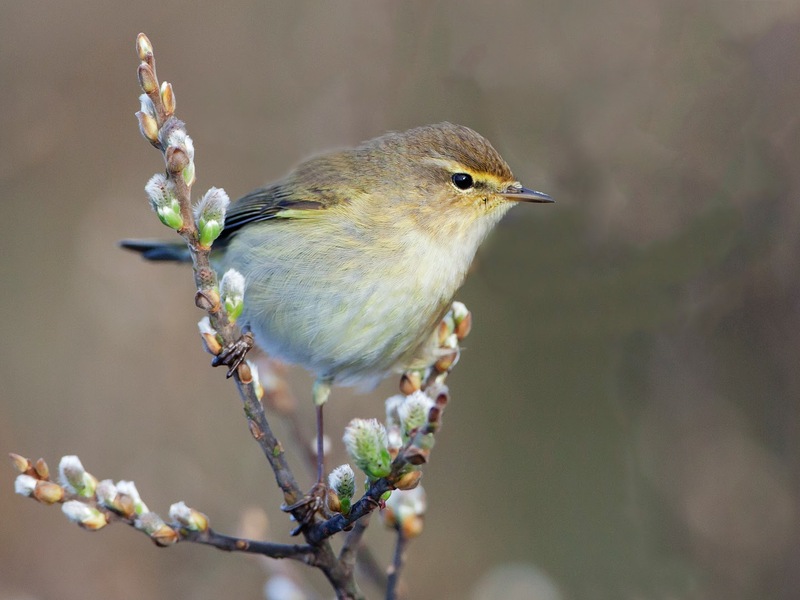 Chiffchaffs are the first in a long line of migrants that will be hitting the Patch over the coming weeks and they are one of my favourite to study. My bird is so busy, bustling from branch to branch, inspecting every nook and cranny for a tasty morsel. When the memory card of my camera flashes full I stay to just observe this little leaf watcher, it keeps me rooted to the spot. After a while the first visitors to the park turn up. 2 joggers have arrived for a bracing early morning run along the beach. They look like serious runners, lycra clad with well worn trainers and sweat bands. They swig isotonic brews from ergonomically designed water bottles and set watches ready to start. But first they warm up, while one does a few stretches the other runs… on the spot. I chuckle to myself, pack up the camera, wish my Chiffy a good morning and slip away from my spot for a spot of breakfast. Nice post Matt and lovely images too! Fantastic post, Matt and I love the pics. 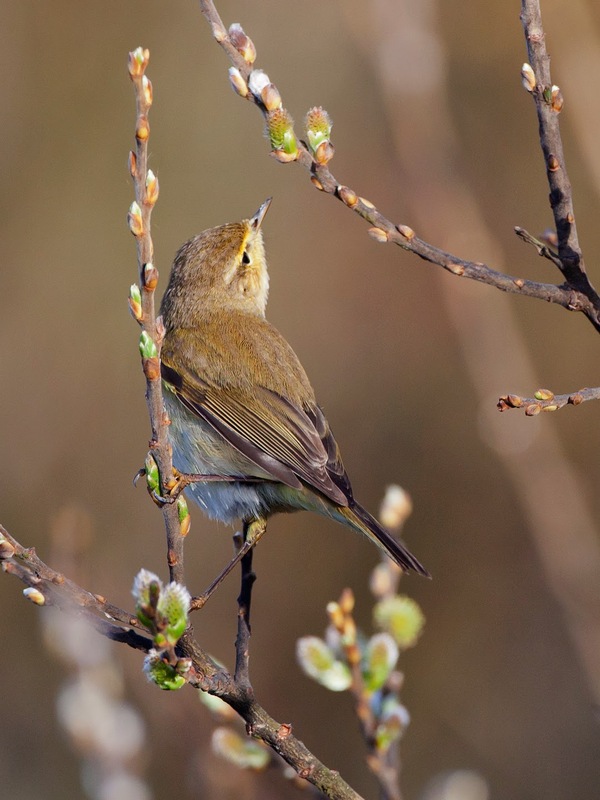 'Our' chiff chaff has returned to the trees near the railway. Welcome back little migrant.